LEGO wants you to build wind turbines — one eco-friendly plastic block at a time. Danish toy manufacturer LEGO teamed up with turbine manufacturer Vestas to create a toy turbine set that you need to assemble, but actually works! Oh, and the blocks are built using LEGO’s new sustainable production process. The 826-piece turbine stands 1 meter (0.3 feet) high when completed. The kit was reportedly made exclusively for Vestas back in 2008 and will now go on sale to the public on November 23. The turbine (once completed) boasts three adjustable blades that rotate — the set includes a motor to spin them — and built-in aircraft warning lights. The vista is further fleshed out by a house, patio, mailbox, flower beds, and a white picket fence, all of them pleasantly rural. 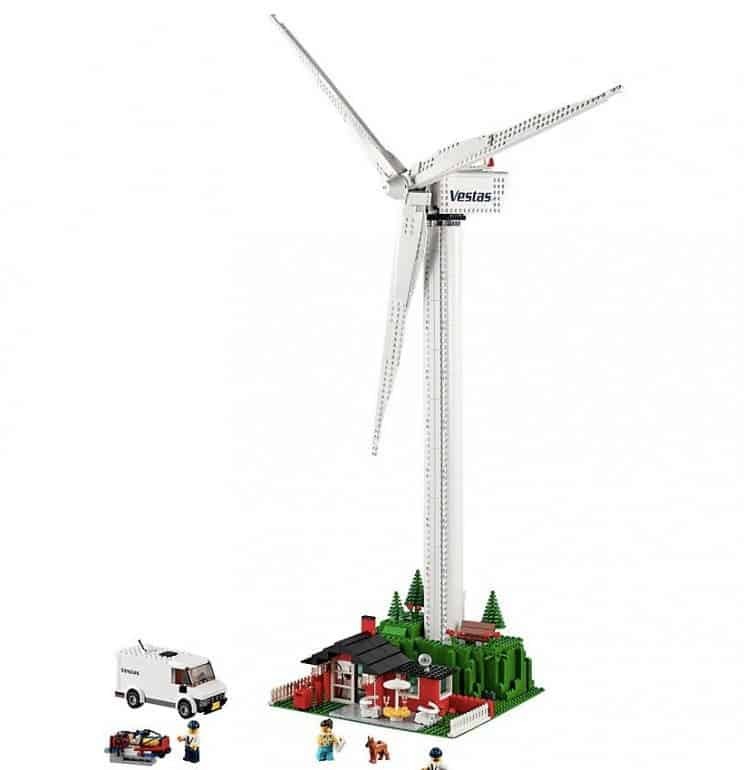 Turbines obviously need turbine workers, so LEGO is also throwing a Vestas van, two service technicians with safety helmets, a lady (who, presumably, inhabits the house underneath the turbine), and a dog (presumably the lady’s pet). Lego did not remain oblivious to the irony of building a model promoting sustainability from unsustainable materials. The kit’s blocks were cast from a new, sugarcane-based plastic that LEGO announced earlier this year. The material, polyethylene, is softer than the traditional plastic LEGO used, but it’s hardy and, according to the company, the blocks are “technically identical to those produced using conventional plastic”. Out of the vault with a #sustainable twist! ??? We're a big fan! ? 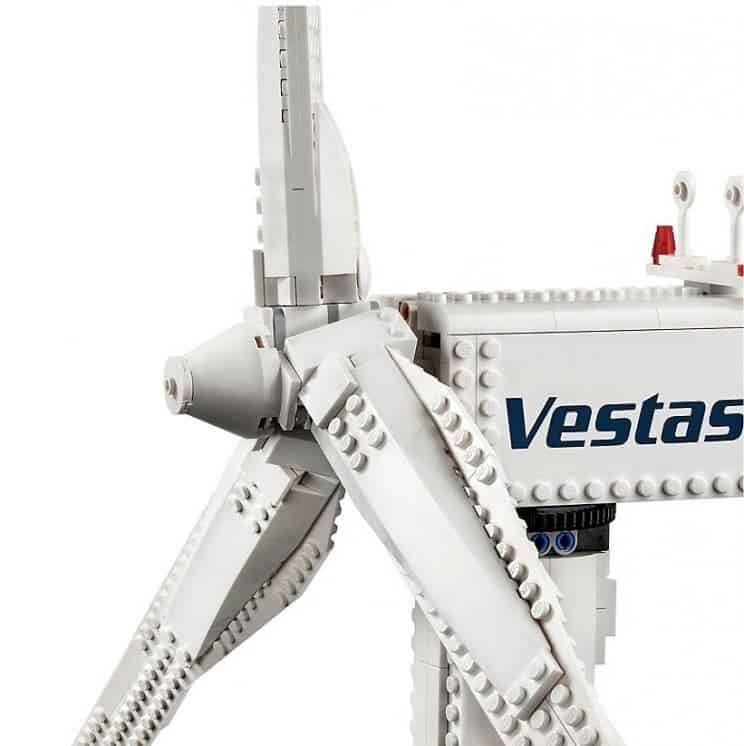 “Today, wind energy is the cheapest source of energy in many markets, which have made wind turbines a sustainability icon across the globe and we are proud to partner with the LEGO Group on this relaunch,” said Morten Dyrholm, Group Senior Vice President of Marketing, Communications and Public Affairs at Vestas. Dyrholm explains that Vestas requested the model specifically to promote wind energy to a small audience within the energy sector. He adds that today’s relaunch of the LEGO set for a global audience “tells the story of how wind energy [has] gone from niche to mainstream, not just within energy but the entire world”. The new kit — along with the plant-based plastic bricks — are part of LEGO’s drive to implement sustainable materials in their packaging by 2025 and their products by 2030.